Student Storyboard guests for Nov. 7 are all students and veterans attending UAA. They are Bryan Box, president of SVUAA, Douglas Bowers and Jeanette Storm. Here is a story originally written for the UAA Seawolf Weekly by Tracy Kalytiak in honor of Veteran’s Day Nov. 11. It is an interview with SVUAA president Bryan Box. Army Specialist Bryan Box served five years, eight months and four days in the U.S. Army, with 775 of those days spent in Eastern Afghanistan, where his Airborne Cavalry Troop patrolled, sat in guard towers and occasionally pummeled Taliban forces with everything from a light machine gun to guided bombs dropped from coalition aircraft. He served with the vaunted 173rd Airborne Brigade Combat Team, and, in one engagement, watched his commanders order the use of 17 2,000-pound guided bombs to annihilate enemy positions along a six-mile ridgeline. Bryan Box serves as president of Student Veterans of UAA. He served in Afghanistan from 2007-2010. Box, who says he was ranked 387 out of 387 students who passed in his high school class—“Everybody below me failed and had to take the 12th grade again”—is halfway through his quest for a bachelor’s degree in biology with a double minor in chemistry and physics. Box loves hunting, fishing and pack rafting, some of the reasons why he moved to Alaska with a friend in June 2011 after two deployments in Afghanistan and 15 months in Germany. He enrolled that fall at UAA. His friend chose to explore geomatics; Box decided to study biology. Veterans are UAA’s largest bloc of students, Box said. There are now 2,100 veterans enrolled here, accounting for 14 percent of the university’s enrollment. Shortly after he arrived on campus in 2011, Box saw a Student Veterans of UAA flier posted in the Spine and went to a meeting. Four people were there and elected Box to be secretary for 2011-2012. He served as vice president in 2013 and became president in January. He and another SVUAA member, Doug Bowers, rebuilt the club after many of its members graduated last year, focusing its efforts on camaraderie and public service. One Friday, the group helped feed homeless vets. Another activity, the following day, focused on providing a fun Halloween for children. When he’s not studying science in class, Box uses science in his art. He projected onto a sheet of plywood an image of soldiers he’d photographed on a Pakistani-border ridgeline as they walked back to their patrol base near Tana Kalay. Then, he hot-glued shell casings onto the wood, in the shape of the image. Box covered it with a tarp and dumped about 500 pounds of sand on it, to press the linen into the steel, and left it for 36 hours to let the reaction progress to completion. The 4-by-8-foot creation was featured in the “Service Before Self” charity art auction Sept. 11 at the Alaska Airlines Center, in a display honoring military personnel and first responders. Auction proceeds benefited Alaska’s Healing Hearts and Dollars for Dogs. Box, who grew up in western Massachusetts, said he would have been born in Kodiak if his mother hadn’t had to retire in 1982 from the Coast Guard because of rheumatoid arthritis, after recovering from an accident. “She was running a rescue boat when a rogue wave slammed her into the engine block back first,” Box said. His father, also in the Coast Guard, retired the same year. Box says he joined the Army just days after graduating from high school, near Pensacola, Fla.
One reason, he said, was because of his family’s tradition of service stretching back to the 18th century. He remembers the other moment that energized his resolve to serve. Box was making burgers at a McDonald’s in 2003 when the manager told him to turn on the TV and he saw soldiers of the Third Infantry Division’s Sledgehammer Brigade storming into Iraq. He talked with a recruiter and said he wanted to be a cavalry scout in a mechanized cavalry unit. He arrived in Afghanistan in 2007. During his time there, Box saw what an 80-pound charge sealed in a pressure cooker buried two feet deep could do to an armored vehicle—and the people inside. He saw ferocious amounts of violence on that first deployment, and shattered his leg during an airborne operation a few months after returning to Germany. Box was supposed to return to his mother’s home in Athens, Ga., in October 2009. On his last day, he learned he’d be staying in Afghanistan for another 16 months. Afghanistan gave him rewarding experiences as well as hellish ones, Box said. He said that school was the first step toward creating an actual elementary school for women, to combat the Taliban’s desire to subjugate women and girls by denying them education and other opportunities. Box says one of the positive things about the Army and an all-volunteer force is that the people who serve are demonstrating commitment to their community. Box mentioned a convention speech he heard that touched him, which stated that the American veteran no longer believes in the American dream. Doing a tour in the Army changed Box’s view of the world. 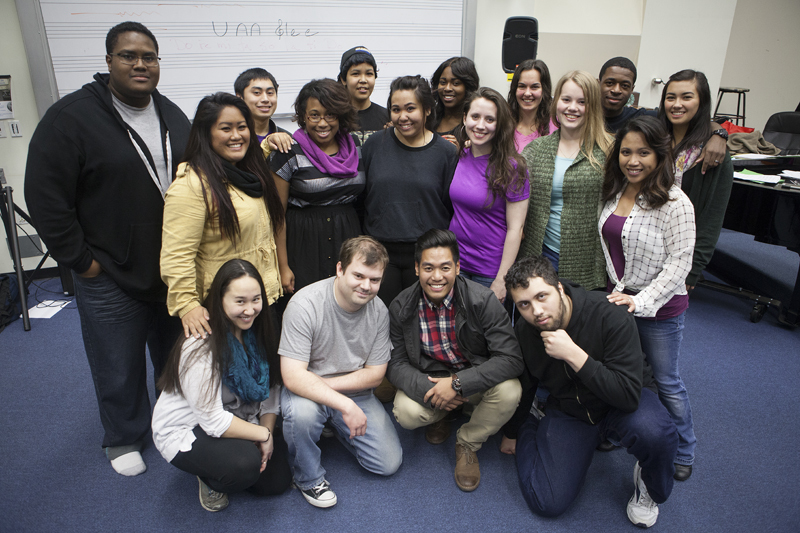 Members of Fall 2014 UAA Glee Club. If you ever need a lift, sit through a UAA Glee Club practice. I’ve done it twice, and each time was, well… heartwarming and a whole lot of fun. I always left with a smile on my face, thinking the world was a pretty nice place if it included voices and energy like this. I suspect if you catch these troubadours opening Oct. 9 for A Cappella Festivella, you’ll be grinning and tapping your own toes well before the main act, Filharmonic with Fermata Nowhere, takes the stage. The club is also preparing for their once-a-semester concert. This time it will be in Wendy Williamson Auditorium on Nov. 21. Mark your calendars! The concert is always free but the club accepts donations to go toward paying for rental use of mics and performance space. Fall 2014 makes season nine for UAA Glee Club, by the way—the steady outgrowth of the original club launched by music performance voice major Alex Pierce in 2010. Each semester equals one season for the club. Two years after the launch, Pierce graduated. Jillian Pollack headed the club for a year, and now member and music education major Lailani Cook has stepped up as its new president. My first time witnessing their talent came Sept. 6, a Saturday afternoon as students were trying out for a slot on the fall semester roster. For auditions, prospective members and club officers gathered in a Fine Arts Building classroom with a piano off to one side. The room was set up like a small amphitheater with an obvious if tiny performance pocket right down in front. Lailani, this year’s president, called the hopefuls forward one by one according to a number they’d selected. Talk about brave! Each student stepped to the center and—with no accompaniment or microphone—sang the tune they’d chosen for their audition. Lailani explained that having students sing a song of their own choosing can demonstrate personality and showcase their voice. Having each sing the birthday classic gave her and other club officers a chance to compare voices on the similar lyrics and tune. Tryouts also included a bit of choreography. Everyone trooped over to a new location, a different classroom in the Fine Arts Building that included a stage. Hazel De Los Santos, club vice president, pulled up a tune on a nearby computer and proceeded to give dance moves in short sequences while those behind her mimicked her steps. Lailani explained that this part of the tryout is an opportunity to see how people fit together and how quickly they pick up dance moves. Of course, more people tried out than club officers knew they could accommodate. A lot figures into those selection decisions, Lailani said. For one, keeping the group at about 20 makes it easier to plan rehearsals, coordinating schedules being easier the smaller the group. The other factor is the requirement for certain voices. Three people with similar voices might need to be whittled down to one position. The next time I visited with this group, they’d secured the opening act for the Oct. 9 A Cappella Festivella and were prepping tunes for that. They were also thinking ahead to their big production on Nov. 21 and holding solo auditions for performances unique to that event. By now, semester singers had been selected and it was clear performers were melding into close-knit colleagues. The love of singing and the pleasure of performing together played out on everyone’s faces as they practiced numbers. Over and over, I heard references to the group as an extended family. There are up days and down days in rehearsal. The group is a blend of some professionally experienced singers with some talented amateurs. The leadership challenge for Lailani is to keep everyone on the same page and moving toward their performance goals. At 29 this November, mom to a 10-year-old and married to a military spouse, she says she’s a little older than other club members. She’s also been in charge of a church choir before, but acknowledges she had a lot of adult support when she did it. She strongly feels this group and its success rests on her and the other club officers ability to stay organized. She’s practicing strategies she hopes will lead to success for everyone. That includes keeping communication simple and straightforward. “We have members with beautiful voices who can’t read music,” she says. So directions need to be inclusive and easy for all to follow, something that taps into her obvious leadership abilities. She’s warm and friendly and seems comfortable leading the group. But even when one piece of a song turns out a little rocky in rehearsal, the smiles and energy—from her, the club officers and the entire group—never quit. When they stumble, it seems no one can wait to “take it from the top” again. Don’t miss the chance to see them perform Oct.9 and again on Nov. 21. And just maybe, if you play your cards right, they’ll let you sit in the back of a classroom when they rehearse, and you can get a more frequent dose of their certifiable uplift!